In a new study, nitrate concentrations and loads in the Illinois River from 1983 to 2014 were correlated with agricultural nitrogen use efficiency and nitrate discharged from Chicago’s treated wastewater. The amount of nitrate that flowed down the river each year from 2010 to 2014 was 10 percent less than the average amount during a baseline period of 1980 to 1996. This reduction is a positive step toward the ultimate goal to reduce nitrate concentrations by 45 percent. 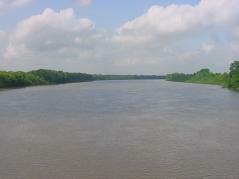 URBANA, Ill. – Good news - the quality of water in the Illinois River has improved in one important aspect. A new study from the University of Illinois reports that nitrate load in the Illinois River from 2010 to 2014 was 10 percent less than the average load in the 1980s and early 1990s. “The recent reduction in nitrate load in the Illinois River is a promising sign,” says Greg McIsaac, U of I researcher and lead author of the study. The study was completed last October, before data for 2015 were available. “Now that these data are available, we know that the Illinois River nitrate load from 2011 to 2015 was 15 percent lower than the load measured in the baseline period from 1980 to 1996. This 15 percent reduction is a milestone that the state hoped to achieve for all its rivers by 2025,” he says. In addition to examining trends in nitrate loads and concentrations in the Illinois River from 1976 to 2014, the authors tried to identify reasons for changes in loads and concentrations. One possible source of change considered was nitrate in treated wastewater discharged into the Illinois River by the Water Reclamation District of Greater Chicago from 1983 to 2014. The authors also used annual records of fertilizer sales, livestock numbers, and crop yields to calculate residual agricultural nitrogen for each year—that is, the nitrogen made available to crops in fertilizer, manure, and biological fixation, but not absorbed by the crop or harvested in the grain. “A significant portion of this residual nitrogen is left in the soil as nitrate and can be washed into the river, primarily through groundwater and subsurface drainage tiles in agricultural fields,” McIsaac says. Mark David, U of I biogeochemist and co-author of the study, says the residual agricultural nitrogen was highest in the late 1980s, following a major drought and low corn yields in 1988. From their analysis of the data, the team found that annual nitrate loads were significantly correlated with river flow, nitrate discharged in Chicago wastewater and residual agricultural nitrogen averaged over a six year window. Nitrate concentrations – the average weight of nitrate in a typical gallon of river water – were also correlated with residual agricultural nitrogen and nitrate discharge from Chicago, but not river flow. Nitrate loads are strongly influenced by precipitation and river flow which can be highly erratic. "It is promising that nitrate loads have declined in recent years despite higher than average river flows. The five-year average river flow from 2007 to 2011 was the highest recorded since the start of measurement in 1939,” McIsaac says. Nitrate concentrations, on the other hand, have declined more consistently since about 1990, which was a period of high concentrations. The reason for the divergence between nitrate concentration and load, explains McIsaac, is that the load is the product of both concentration and river flow and the flow is strongly influenced by precipitation, while concentrations are not. Higher flows allow the river to carry more pounds of nitrate, but it doesn’t necessarily change the concentrations. The study, “Illinois River nitrate-nitrogen concentrations and loads: Long-term variation and association with watershed nitrogen inputs,” written by Gregory F. McIsaac, Mark B. David, and George Z. Gertner, is published in the Journal of Environmental Quality and available through open access at https://dl.sciencesocieties.org/publications/jeq/pdfs/0/0/jeq2015.10.0531. Data used in the study was provided by the US Geological Survey and the US Department of Agriculture. Partial funding was provided by the Illinois Environmental Protection Agency and National Institute of Food and Agriculture, USDA, under Agreement No. 2011-039568-31127.